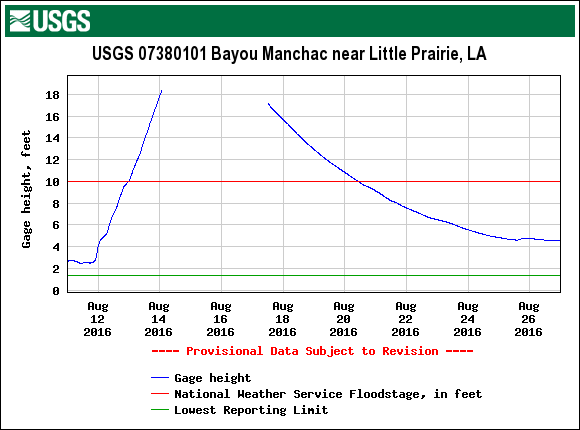 Like everyone in the Baton Rouge area, we have plenty of stories about the unprecedented flooding. We figured we’d post a few tidbits as we get ready to head back out onto the waterways. All through the spring and summer, I had been converting an old 800-square-foot shop warehouse space into an apartment for my parents. They finally moved in… just a few weeks before flood water joined them. Well, I should be able to be able to finish it even better the second time around, eh? A couple of us at the core of PaddleBR have our own veritable fleets of canoes and kayaks that we happily bring to events for people to paddle. I had left one of my canoes at my sister’s family’s place so they could paddle it around in the pond in front of their house. Saturday morning, they woke up to water all the way up to the porch, with their cars already lost. The canoe became their evacuation route — they actually paddled it into the house and picked people up from their living room stairs until all eleven were safely on their way to shelter. Many times, we’ve ended paddle trips (especially night paddles) at Jonathan’s place on Bayou Manchac, and his fleet has seen many a PaddleBR paddler. His home is elevated way up high, so even the 1983 flood shouldn’t be a problem. This was higher (obviously). We went out the Thursday after and cut up a big fallen tree on Manchac to get his pontoon boat access to help start salvage and recovery ops. 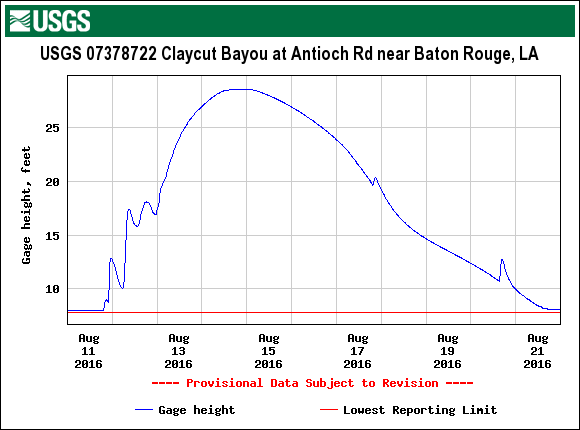 Rachel’s parents live near Claycut Bayou, and as the reading kept rising, eventually I couldn’t take it anymore, so I biked across town to check conditions myself. 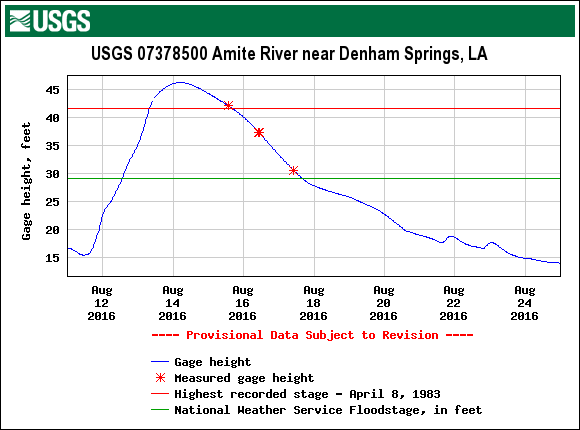 When I got there, I found the bayou already backflowing (with the Amite nowhere near cresting). With the help of many sandbags and two days of exhausting work, we managed to save her parents’ place. 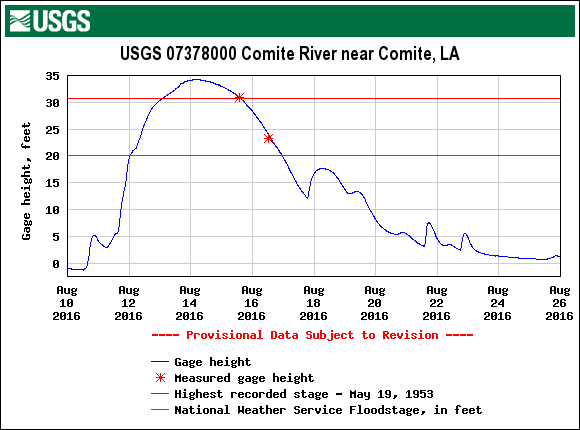 The relief at one successful fight was tempered by the knowledge that her dad’s business equipment was lost in the Amite flooding near O’Neal. Those are just a few snippets of the many stories we have from the flooding. We know everyone has their own. With all the recovery work, it’ll be a while before things get back to some semblance of “normal”, but we’re all still here. 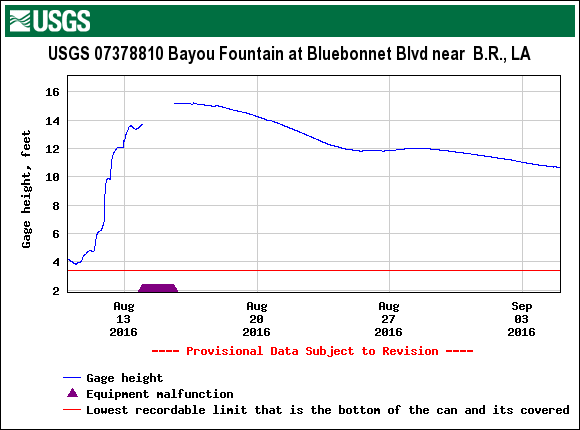 It looks like next weekend we’ll be heading out onto Bayou Fountain. It’s still at a level which would, in normal times, be considered “extremely high”, but we haven’t had a chance yet to even scout it out to see how many trees have fallen and what else is out there. There are certainly going to be some issues to work, and some of them won’t be able to be completely cleared until the water’s low enough to reach down to them with our handsaws. Still, we’re looking forward to getting out there, and anyone who wants to come along is welcome. ← Night Paddle on Bayou Manchac!